We Axcel gases, along with our associate companies are a renowned High pressure seamless cylinders supplier, manufacturer and exporters in India. High pressure Seamless cylinders are required for the purpose of Filling, Storage and Transport of various gases. These are special types of carbon alloy steel cylinders shells and the alloy composition depends upon the pressure rating and water volume of the respective cylinders. For low volume and low pressure(Upto 150Kg/Cm2), Manganese Alloy steel is used. For high volume and high pressure(More than 150Kg/Cm2), Chrome Molybdenum alloy steel is used. All the high pressure seamless cylinders are manufactured as per Indian standards IS: 7285 – Part 1 & part 2 and are equipped with cylinder filling permissions issued by CCOE – Nagpur ( Chief Controller Of Explosives – Nagpur, a Department under Central Govt. Ministry of India). We can also provide cylinders as per various other international standards like EN 1964-1, ISO 11439, NZ S 5454, ECE R110, & ISO 9809. These cylinders are strictly made as per the guidelines of respective standards using high quality machines and with advanced techniques. 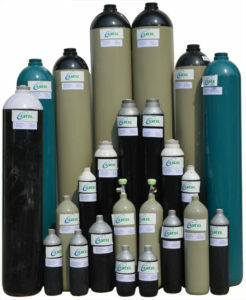 Cylinders are available in a working pressure range of 150 Kg/Cm2 to 350 Kg/Cm2. Each and every cylinder is hydraulically tested at a pressure 1.5 times of working pressure. There is a wide range of cylinders available with us starting from 1 Ltr WC to 80 Ltrs WC as mentioned in the technical specifications below. We also supply High Pressure Seamless Cylinder quads or cascade as per particular requirement of the customers.